In this day and age, the multilingual employee is a superhero for their business. According to a study done by the University of Phoenix, within the next ten years, 70% of employers expect business proficiency in Spanish to be in demand and 42% expect employees to be business proficient in Chinese. Multilingual employees are already meeting that need, giving their employers a head start into the future. Thinking about taking your business international? Having a knowledgeable multilingual employee on staff can be a great asset when expanding your business overseas, both for speaking/translating and for knowing proper business etiquette. For example, did you know that Chinese businesspeople present items of importance with two hands and a slight bow? An employee familiar with that culture would be able to stop you from sliding your card one-handed across the table and committing a serious faux pas. Moreover, they’re able to communicate more authentically with business counterparts from different parts of the world because they understand the nuances of the language and the ins and outs of doing business in another culture. From a customer-facing standpoint, having a staff with multilingual speakers allows employees to better care for the diverse set of customers that patronize your business. In the United States alone, there’s a population of over 37 million Spanish speakers. For some of these people, Spanish is their only language. Having employees who can communicate with this large demographic puts your company at an enormous advantage. If your staff can communicate with customers and better understand their culture, then you could see an uptick in business. According to a study done by Northwestern University in 2014, people who can speak more than one language are able to process information at a faster rate than others who only speak one language. The study found that since bilingual people are constantly switching from one language to another, their brain is able to distinguish irrelevant information faster. A smarter and faster-working employee who can help you expand globally and reach new customers? Who wouldn’t want that? In a world that’s becoming more globally connected and diverse, hiring employees who can make connections and navigate this new space easily can put your business at a huge advantage. Do you have employees stationed overseas? A major move like that can be incredibly stressful. 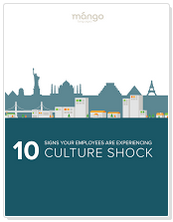 Learn more about preventing culture shock and feelings of isolation by downloading our checklist of 10 Signs You’re Experiencing Culture Shock.